Last year I camped overnight in the bush, just off a logging trail in Olney State Forest during a climbing weekend with the Shrek Man. Far down below us from the valley floor the sounds of cattle lowing came, any sight of the vocalisers lost to us under the layer of morning mist. We headed off after breakfast to poke around the cliffs we had first spied from the other side of the valley on some previous adventure, before our exploration was unexpectedly cut short by the failure of a battery powered drill, required to affix climbing bolts to the cliff face. It was in search of this makeshift camp site that I set out this morning, alone in the Scooby Doo as everyone else slept in. We hope to revisit it again soon, and before heading there with friends in tow it seemed sensible to make sure I could find it once more, without the guiding wisdom of my climbing buddy. With a camera to document my trip, and two water bottles ready to refresh me as the day’s expected heat built I wound my way through the valley, passing through the still awakening town of Wollombi. A few kilometres on the far side of the town I stopped to pick up a hitcher, standing on the side of the road with a 5 litre container each of water an oil. “Only going as far as Millfield” I warned as he got in. “Fine by me mate, f*ckin’ truck’s broke down there and that’s where I’m headed now to get the f*ckin’ thing back”. Billy was his name, and he talked a storm the whole way through a toothless mouth, with breath tinged with the morning tobacco; telling the story of his wife’s broken starter motor, her boot full of groceries wilting on a hot day in her stranded car, his trip to retrieve her and his truck’s subsequent breakdown. “To cap off the whole f*ckin’ thing I got a call from the taxation department Monday this week to say that they’re gonna audit me for the last six f*ckin’ years”. Life throws f*ckin’ challenges at us all at times and this was Billy’s f*ckin’ time apparently. Millfield is a small town South of Cessnock named after the timber mill which processes timber sawn and drawn from the surrounding State Forests. The mill marked the point at which I swung right, off the sealed road and began to climb out of the bowl of the valley into the high hills. A thin snake of dust trailed behind me as the tyres chunked on hard packed clay and sharp gravel. Signs warned of logging trucks on the road, and occasionally bare areas of logged trees stood forlornly bereft of life. Halfway up the mountain I paused to allow two horse riders to pass me, rather than me passing them and risking skittering their rides. We exchanged words and wisdom of the road ahead in our respective paths. Allowing them to draw some distance behind me I continued on, taking always the left, uphill fork whenever a choice presented itself on the road. Eventually I reached Flat Rock Lookout, a cliff-face immediately on the side of the road and high above the valley floor. At this point I knew I was close and stopped to take in the view. 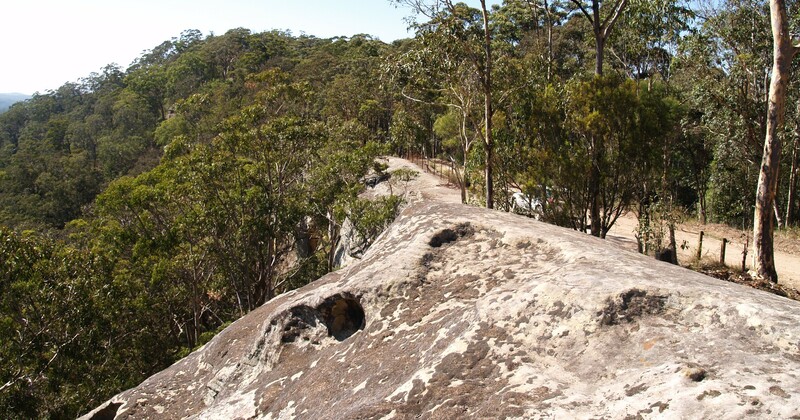 Flat Rock Lookout provides a fine view from the rim of the plateau, farms dotted amongst the cleared grassland in the Congewai valley, and the furthest sides of the plateau bowl lost in the blue oil haze of the eucalypt forests growing thickly up the slopes. The lookout is unfenced, save for a single section of rusted old cyclone fencing standing uselessly ahead of my parked vehicle. With the camera hanging by its strap around my neck I took a deliberate and careful step further out on the ledge, though here it began to slope down before dropping off precipitously some 4 metres ahead of me. In a moment my feet began to lose traction on the sharply sloping, dry, moss covered rock and all too quickly I found myself, alone in the midst of the forest, spread eagled on the rock and a metre further down and closer to the edge than safety called for. One hand clung to a small indentation above me, one foot with tentative purchase on the rock, one slowly slipping on the moss. For what seemed a long, long time I felt powerless to stop my continued slide to the edge and I considered the very real possibility that I would die here, today, probably before anyone else in the family was even awake. I stabilised myself for a moment, swore and thought frantically how to prevent myself sliding the remaining three metres or so down across the 35-40 degree slope of mossy rock to the edge – flipping uncontrollably and irrevocably over. In a short, unexpected moment I had slipped from the normal to the thin lipped edge of life itself. Slowly, gingerly, with great deliberation, transferring of weighting and adjustment of grip and balance I managed to make my way back up the half a body length that represented the long journey between this life and a bloodied ending below. One short crawl measured in heartbeats and breaths, punctuated with the desperate longing to have the time to properly berate myself for my stupidity. Later, back in the car and with just a small graze on my arm as a souvenir, I continued on, and soon afterwards found the track to the camp site. Alighting from the parked vehicle a rapid rustle of leaves ahead of me announced the presence of a goanna, startled by my arrival it climbed in a furious scrabble up a nearby tree and remained, clinging there until I left some time later. Given my recent experience I envied it’s long, sharply curved claws. Having surveyed the campsite I headed back down the 13 some kilometres of dirt road until I eventually rejoined the tarmac at Millfield. By now the nascent heat of the day was at full bore and the black top of the road shimmered ahead of me. I pulled over at Wollombi to have a coffee and read some pages of Kerouac’s On the road. On the timbered balcony of the Wollombi Cafe I drank strong, black coffee, it’s thick beany aroma an affirmation of the life I had almost seen the end of just an hour or so before. A small skink clambered unconcerned across the square timber hand rail. Two tables ahead of me a local couple negotiated the guest list for their upcoming wedding and reception. Behind me a family of four tourists discussed the idea of a future “big family holiday” to Europe or the Americas. They described to their children the various places they could visit, many of them a revisit for the parents to those favoured locations they had seen together on their honeymoon years earlier. They settled on England and Europe over the USA, and before leaving I gave up the guilty secret of my eavesdropping by suggesting to them that they add Norway to their list, and that they break from the roadtrip with a few days spent on a narrow boat on England’s canals. Buying a bunch of dried rosemary from the small shop at the cafe, I headed home. Normality had again asserted itself after the drama of earlier. The road from Wollombi is a popular one for Sunday drivers and particularly bikers. The Wollombi Tavern regularly hosts several dozen bikes out front, a mix of Harley chrome, Ducati red and yellow, and a wide selection of Japanese road bikes. Near to ridgesong there is a notorious bend called Lemmings Corner which all too regularly finds a wannabe racer running out of talent and road and smearing him or herself along the tar, leaving shards of glass and fibreglass in a litter of violence along the edge. Approaching Lemmings an oncoming car flashed me a headlit warning, and soon enough a trio of bikers waved me to a halt. “There’s been an accident ahead – go slow and watch out. It isn’t pretty.” I fully expected that Lemmings had claimed another namesake. Instead however a falling branch had dropped the power line across the road, and soon after a pair of bikers had rounded the bend heading South. The lead bike had hit the fallen, live wire and the electrocuted rider had immediately dropped his bike. His companion paced the road in grief. I carefully and respectfully sidled past the fallen rider’s body, lying still in the middle of the road, his sightless eyes shrouded with a small blanket provided by a stopped motorist. Emergency services had already been called, and before I could reach the Bucketty RFS depot to dispatch a crew for traffic control an RFS Cat-9 approached, siren off and lights turning a grim red and blue salute to the rider’s demise. At home the power was off, the supply cut by the fallen wire. My morning had been one of unexpected twists and turns. My own stupidity had nearly cost me my own life. I had later listened in on the hopeful plannings for lives ahead; a marriage and life together and a family vacation. Another man’s life had reached a sudden end through no fault of his own. I had come close to death twice today. The corners we see coming are those we prepare for and take in our stride, it is those that thrust themselves surprisingly into our path that cause us to lose our hold on the firmament and skid uncontrollably off, powerless to save ourselves. In one short morning I had been reminded of the tenuous grip we each have on this world and to the lives of those we love and live with. What had started with a light, unconcerned step into the morning in exploration now seemed a vastly different day. The hot sun baked the leaves dry on the ground, but somewhere today someone’s tears will dampen the earth. This entry was posted in ADVENTURES, MUSINGS by Simonperry. Bookmark the permalink.